SHAC is a volunteer nonprofit organization whose mission is to enrich the cultural fabric of Shaker Heights by establishing the arts as a vibrant and integral part of the community. Our purpose is best described as "building the community through the arts and building the arts through the community." The initial idea for a volunteer, community-run arts organization came in 2002 from then - Shaker Heights Mayor, Judy Rawson. City Council members Brian Parker and Jan Devereaux supported this concept, and they recruited community activists Jan Thrope and BettyAnne (BA) Greene to create the Shaker Arts Council (SHAC). The co-founders immediately got to work identifying local artists and art enthusiasts. Their goal was to promote to an adult population the many professional artists living and/or working in Shaker Heights, a community home to Cleveland Orchestra members, Cleveland Art museum curators, other museum and gallery directors and curators, musicians and music teachers, arts faculty members at the high school and university level, Grammy award winners, and numerous other performing, visual and literary artists. Incorporated in 2004 with a Board of Directors composed of nine local citizens, SHAC was granted 501(c) 3 status in 2005. SHAC’s first project promoted local artists in Storefront Window Displays at Shaker Towne Center (STC) while simultaneously introducing the organization to the community. In addition, this public project demonstrated SHAC’s commitment to serving as an economic engine whenever appropriate. The initial Hard Hat Gallery occupied an empty storefront at STC and featured works by some of Shaker’s most recognized fine artists. This exhibit has been followed by a number of exhibitions at Van Aken Center, Sussex Courts, the Shaker Public Library and Juma Gallery. 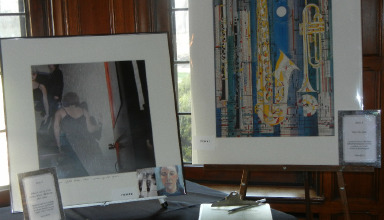 Of particular note was the exhibit showing the entries to the SHAC-sponsored poster design competition in celebration of the City of Shaker Heights’ Centennial in 2012. Since 2003, the AHa! (At Home with the Arts) series has been a staple of SHAC programming. These intimate performances have featured a wide variety of performing and literary artists, many of whom are Shaker residents. Whether theatre or poetry or magic or dance, audiences have been treated to outstanding performances in the intimacy of a Shaker Heights home or a local business or institution venue, such as Loganberry Bookstore and the Nature Center. 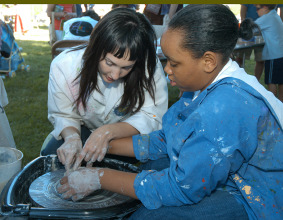 The Shaker Arts Council’s signature event began in 2004 as the Solstice Festival. Held at the Shaker Colonnade, the initial event was a music festival celebrating the longest day of the year. As the years progressed, the festival grew to include local food vendors, a crafts show and children’s activities. After the 2010 festival, the Ohio Designer Craftsmen (ODC) organization approached SHAC about combining their crafts fair with SHAC’s music festival. In 2011, in partnership with the ODC and the City of Shaker Heights, SHAC presented the Shaker Heights Arts & Music Festival. This street festival, held adjacent to the Van Aken Shopping Center, continued to grow each year through 2014. Due to the construction of the new Van Aken Center, the 2015 and 2016 festivals were held at the Shaker Middle School. After a dozen years, the event bid the community a fond farewell. The 2008 SHAC produced In Concert with Ludlow was an effort to use the arts to heal and unite the community after a particularly violent incident. It remains a highlight of SHAC’s early years. After a successful 2016 pilot program to wrap local utility boxes with artist designs, SHAC plans to move ahead with this effort by engaging local professional artists to produce designs for utility boxes throughout the community. In addition to these events, the arts council has sponsored educational programs including the Lecture Ways series, in association with Hanna Perkins, and a Bike Art Tour, in partnership with the Shaker Historical Society. In 2016, SHAC created a self-guided tour of Shaker Public Art that is easily accessible online and via any mobile device. Finally, SHAC is an advocacy organization, supporting local arts initiatives and working with local government and businesses to incorporate art into their buildings and programs. Currently, the organization’s ongoing Artists’ Directory project is being uploaded to the SHAC website. In its second decade, SHAC continues its goal of Building Community through the Arts and Building the Arts through Community. The Shaker Arts Council is funded primarily by membership dues, private donors, local grants and corporate sponsorships. Click here to see a list of Charter Members of SHAC. Please contact the Shaker Arts Council if you are interested in joining any of the committees.